Little by little, the trade market for Giancarlo Stanton is coming together. There’s no clarity on when he may be dealt. But we’re starting to learn more about what teams he prefers and what teams are most interested. 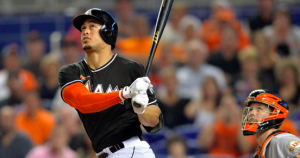 Stanton has reportedly given the Miami Marlins a list of teams to whom he would accept a trade. While we don’t know the exact teams on that list, we have enough to update each team’s chances of trading for Stanton. It’d be nice to know whether or not the Cardinals are included on Stanton’s list, but we know for sure that St. Louis is interested in trading him. The Cardinals also have the pieces to offer the Marlins a package of prospects they would like. There are also reports that even if Stanton doesn’t include the Cardinals on his list, the Marlins could give St. Louis a chance to pitch Stanton on accepting a trade there if the two teams agree to a trade. The Dodgers are the only team we know for sure is on Stanton’s list. That fact alone makes them one of the favorites to land him. There’s no doubt that Stanton, a southern California native, would welcome a trade back home. There’s also little doubt that Los Angeles has the money to afford his contract and enough young talent to make Miami a suitable offer. It’s just a matter of whether the Dodgers think they need to invest those kinds of resources after coming up just one game short of a world championship. Much like the Cardinals, we know that the Giants have made a formal trade proposal to the Marlins. There’s also a good chance that Stanton would accept a trade to San Francisco. Financially, the Giants would be able to take on most of his contract. However, the Giants are short on young talent, so they’d need to get creative when it comes to giving the Marlins a package of prospects in return. There’s nothing concrete connecting Stanton to the Phillies. But the move would make sense for all parties. Philadelphia would love to do something big this offseason, and they have more than enough young talent to entice the Marlins in a trade. Stanton may prefer the west coast over the east coast, but there’s no doubt he would love playing half his games in Citizens Bank Park. Boston was one of the early favorites to trade for Stanton. However, recent reports describe the Red Sox as an “extreme long shot.” That being said, Boston wants to add a power hitter this offseason, and they could certainly make things work financially. Even if the Red Sox aren’t active in trade talks right now, they could jump back into the Stanton sweepstakes at any time. If only we knew the teams on Stanton’s list, things would be a lot clearer. As it stands, it’s tough to rule out any team completely, so there’s still a decent chance one team comes out of nowhere to land Stanton. The Yankees, Angels, and Cubs are all teams that could probably take on the financial burden that accompanies Stanton. There may also be a few other teams willing to get creative to make a trade happen. At this point, it’s highly unlikely that Stanton isn’t traded this winter. The Marlins have essentially told him that if he’s not traded, they’ll have to trade every other veteran on their roster. That’s not a scenario Stanton wants to live through. Of course, he does have a no-trade clause. Stanton could also wait and opt-out of his deal in a couple years. Obviously, that’s unlikely to happen. But it keeps the chance of Stanton not being traded at around 5%.